I was working on this issue today with one of our team. A client reported that they could not login to their Windows Server 2008 Terminal Server from their iPad. He is using iTap on his iPad. 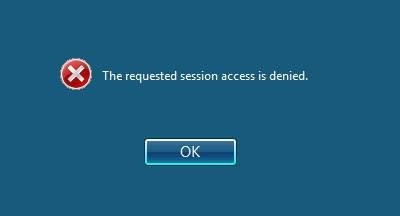 The error message we kept getting was “The requested session access is denied”. We verified that we could access the Terminal Server / Remote Desktop server using our Admin account and thought that maybe it was linked to the clients account. He brought his iPad into the office and we tried the Admin account from the connection he had created. It worked. We then thought that we’d try it from a desktop using our admin account – that too worked, but when we tried it with his account it didn’t work. Strange we thought – I mean we just launched mstsc.exe from the shortcut we had on our desktop… After a little bit of digging and thought though, it finally clicked. Access is denied… We checked and found that our shortcut used the /admin switch which meant that it would try to take over the console session on the server. Given that we got the same message with both the desktop and the iPad, we then checked the iPad to see that it had a similar console option in the iTap configuration. Changed that and sure enough it worked! 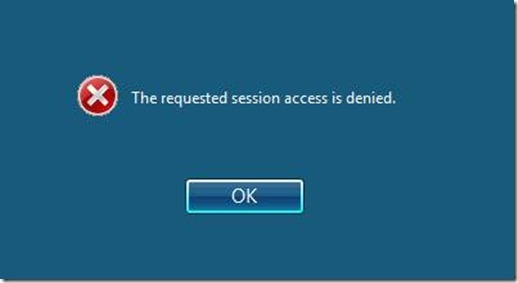 You sir have helped me nail why I was getting access denied. I removed the “administrative session:i:1” from my .rdp file and joy followed. Good one! solved my issue. Thanks – can’t believe that’s hung me up most of the day! Thanks! Taking off console mode worked for me! Brilliant solution, I also forgot the /Admin on the RDP. Thanks a lot !!! You saved my day. Really u made my day & now all joy. Went through hella MS websites & blogs but nothing helped. Helped me resolve the issue as well,thank you so much,you are a life saver!~!! Muito bom! Somente aqui encontrei a solução. Very well! Just here I found the solution!